Beautifully engraved specimen certificate from the Melville Shoe Corporation printed in 1952. 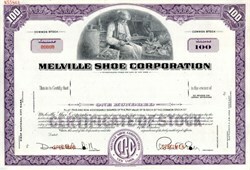 This historic document was printed by the American Banknote Company and has an ornate border around it with a vignette of cobbler in his shop making a shoe. This item has the printed signatures of the Company's officers. Ward Melville - After mass-producing shoes for soldiers in World War I, Melville and an associate opened Thom McAn�s in New York as a low cost, high quality shoe retailer. The chain eventually encompassed over 1,200 stores. With Thom McAn�s as its anchor retail establishment, Melville went on to build a retail conglomerate focused on shoes and apparel. Melville Corporation, formerly based in Rye, New York, was a large retail holding corporation incorporated in 1922 as the Melville Shoe company by Ward Melville. It changed its name to CVS Corporation in 1996 under a massive reorganization plan. The company traded on the New York Stock Exchange (NYSE) under the ticker MES, before changing its ticker to CVS. At its peak, Melville operated over 7,282 retail stores in approximately 3,500 unique locations, providing a wide range of products. Melville was one of the first companies in the world to develop a shared-services satellite communications network, consolidating the infrastructure of all of its discrete divisions, resulting in significant cost savings for the corporation. Beginning in the early 1990s, Melville was under pressure to reorganize and shed its diverse portfolio. Many of the chains the company operated were underperforming. The chain shed all of its retail chains, except for CVS, which accounted for 40% of Melville's revenue. Its Peoples, Standard Drug, and Austin Drug pharmacies were converted to the CVS identity. Most of the company's units that were unrelated to its pharmacy business were shed in 1996. Many of the retail divisions that Melville once owned still operate either as independent companies or as subsidiaries of other companies. During the height of Melville's success, the company operated the following retailing divisions.